As a company, Ruark found fame by making rather nifty loudspeakers during the 1980’s, 90’s and part of the noughties. Since 2006 they have been pouring their considerable talents into designing and building some of the best compact audio lifestyle products on the market today! The newest of these is the R5. Ruark call it a High Fidelity Music System. Now you might think that their description may be stretching the truth a little and you’d be forgiven for thinking this upon first seeing it in the flesh as it is pretty small. Listening is another matter though! It has a lush sound with oodles of detail. This is partly down to the secret weapon lodged on the underneath…….an active sub woofer. This gives a the system a much deeper and more realistic sound than is usually associated with such systems. You can wirelessly stream music, play from a phone via high quality Bluetooth, play from one of the squillions if internet radio stations, plug in a turntable using its built in phono stage or even play one of those old fashioned CD things!! Support for streaming music services such as Spotify, Tidal and Deezer is built in and there are also spare analogue and digital inputs meaning you can enjoy a multitude of other devices and also upgrade the sound from your TV too! Ruark have not skimped on the styling either. There is certain retro chic going on here with the sleek curvy hand crafted cabinet and the fabric grille……all very cool and all very perfect for the music and design enthusiast alike. We love it and we think you will too. The Ruark R5 is available in Walnut or Soft Grey finishes and is on permanent demonstration here in the Cheltenham shop and you are welcome to come in and have a play. Tea and coffee are available! We are delighted to announce that, following detailed discussions (and restraining John), we have decided the movie to be screened at our forthcoming Film Night will be The Matrix. Newly remastered in 4K with Dolby Atmos soundtrack we are sure this classic movie will be ideal to showcase the performance of the top notch home cinema system we are putting together with some of our key suppliers. Pioneer’s flagship UDP-LX800 will spin the discs. Arcam will provide their AV860 processor and multiple power amplifiers. KEF are supplying an £11000 R series speaker package. REL will rock the foundations with a dual subwoofer system. A top quality 4K projector will supply the images. The entire system will be wired throughout with Chord Company cables. This £60,000 AV system is designed to thrill, so do give yourself a treat and come along to The Stables at The White Horse Hotel, Romsey at 7pm on Thursday 30th May. We know you won’t be disappointed! Free car parking is available in Lortemore Place just off Latimer Street, SO51 8DF, directly behind the hotel. Here’s a link for free tickets. They aren’t essential but useful for us to gauge numbers. A FREE to enter prize draw for attendees provides further temptation with the chance to win a £399 Arcam rPhono MC/MM phono stage, £200 Chord Shawline Power cable or a £180 KEF Muo Bluetooth speaker! Representatives from most participating manufacturers will be on hand, along with ourselves, to answer questions and offer advice at Movie Night. We look forward to seeing you all at The White Horse Hotel, Romsey on 30th May. Alan, John and Wayne - Audio T Southampton (Chandlers Ford). Say hello to the brand new R5 from Ruark, officially the bigger brother of the ever popular R4, but with the design queues from the top of the range R7, in fact the R5 is like a scaled down version of this Ruark range topper. The new fabric exterior makes the Ruark R5 look really classy, and with the smooth, slick CD loader and an OLED display the unit offers a discreetly high-tech look, balanced with the furniture grade rich walnut veneered cabinet and soft grey anodised metal-work, result in a minimalist, yet practical design. To operate and control the R5 it could not be simpler. Fitted atop the cabinet is Ruark's trademark controller, the RotoDial, this ergonomically designed control offers instant operation of the main functions, and with the simplest press of a couple of buttons, some of the more advanced features too. Connection Heaven is how Ruark describe the R5, and that is no lie or exaggeration. It starts with a traditional CD player, one offering multi-format support. All three radio systems are incorporated, conventional FM, DAB+ Digital, and internet radio. The R5 boasts a Bluetooth wireless connection, for playing music from all your favourite devices; featuring the latest high specification aptX HD receiver. In addition, both analogue (a separate RCA line input, with separate RCA Phono input) and digital (via optical toslink connection) hard wired inputs are provided. Full wireless music streaming from U-PNP devices; and as mentioned, fully multi room ready. You can also play your favourite tunes from Spotify Connect, with support for Tidal, Deezer and Amazon Music services. Inside the R5's electronics it has a high capacity linear power supply and utilises genuine Hi-Fi grade Class AB power amplifiers, driving the main left and right channel high quality full range speakers. These larger drive units, compared to the smaller R4, are combined with a low frequency bass driver mounted underneath the unit to help give the R5 a truly rich sound, much bigger than the elegant, compact case would suggest. Room filling sound within even a large room, distortion free and with ease. The base unit and reflex port underneath the R5. The heat sinks on the class A-B amplifier. 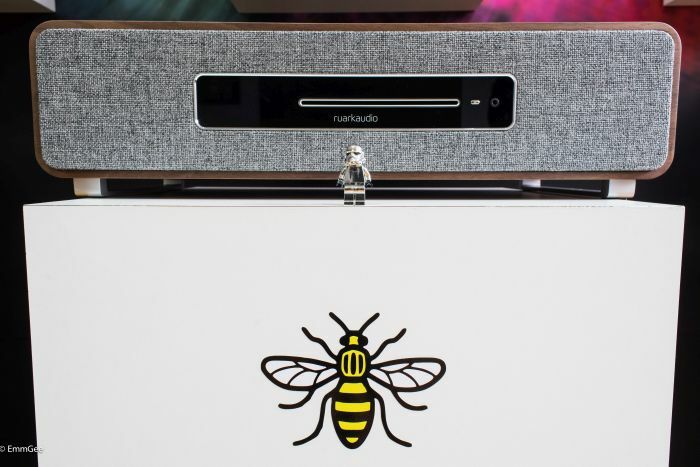 The Ruark R5 in on display and available for demonstration at our Manchester store. We have taken delivery of the first two speakers of Dali’s Oberon loudspeaker range. Dali, Danish Audiophile Loudspeaker Industries, are a company with more than 35 years of experience and we can’t wait to have a listen to them! The Oberon range comprises of two pairs of standmount speakers, two pairs of floorstanding speakers, a pair of on-wall models and a centre speaker. The speakers we would like to show you are the Oberon 5 floorstanding speakers and the Oberon Vokal centre speaker. The Dali Oberon Series is available in four finishes : Black Ash, White, Dark Walnut and Light Oak. The new grills are either Mountain Grey supplied with the light finishes or Shadow Black supplied with the dark finishes. Marshmallow White is available is an extra cost. 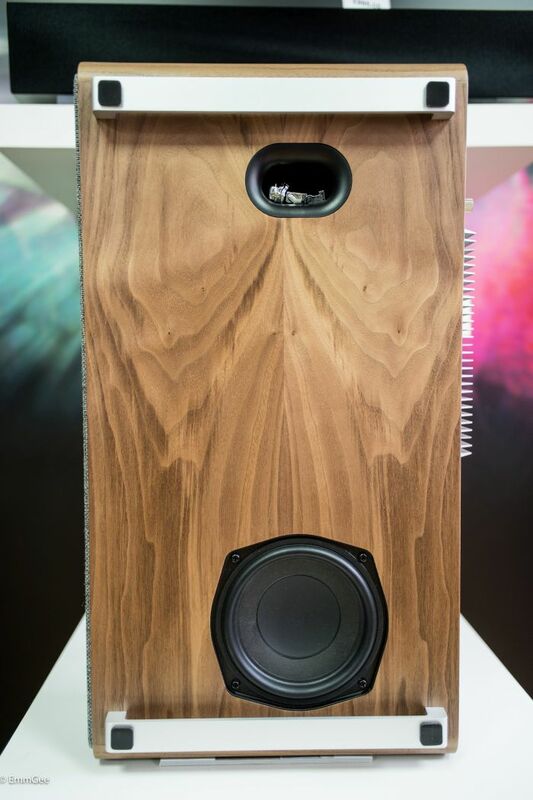 Our speakers have arrived in Light Oak and we have to admit that they look really nice . The Oberon 5’s are 83cm high, 16cm wide and 28cm deep. Like all Dali speakers, the Oberon 5’s fire straight ahead (not angled in towards the listening position) due to the soft dome tweeter’s wide dispersion. The two bass/mid woofers wood-fibre cones take over the mid-range and bass frequencies. The Oberon Vokal centre speaker is an ideal partner for the surround sound system and blends in nicely with it’s soft dome tweeter and two wood fibre cone woofers. The Dali Oberon 5 and Oberon Vokal offer a very nice balanced front soundstage when used together in a surround sound system, just add Oberon1, Oberon3 or even Oberon On-Wall as your surround channels. We listen to all sorts of music and the Oberon 5’s sound fast, detailed, sharp without being bright. A great allrounder. Please come in for a listen . Coffee and tea will be provided. Just 500 limited edition versions of the Rega Planar 1 Plus turntable will be manufactured. 125 of those will have some special and rare prizes hidden at random inside. Ranging from £25 record tokens, to artist signed albums, posters and pictures, and a super prize of two tickets to this years Mercury Music Prize awards! 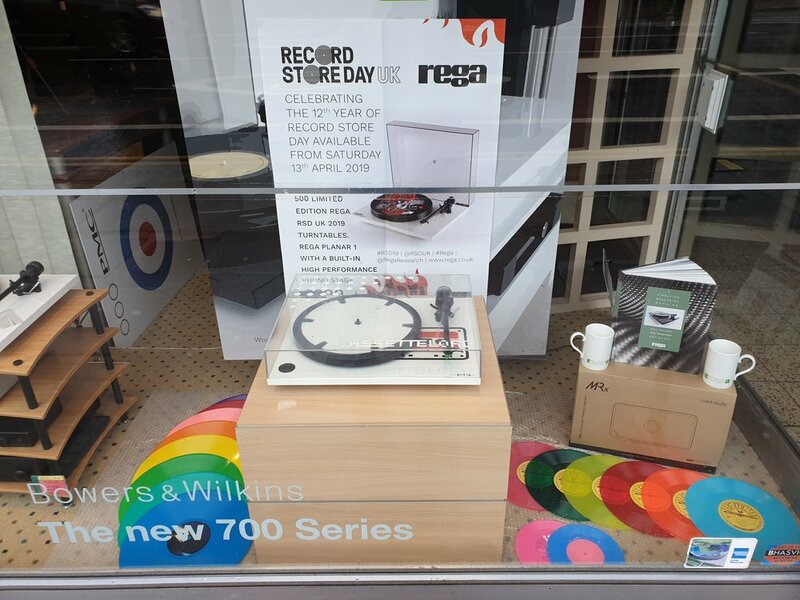 In Brighton we’ll be featuring the Linn Sondek and Rega Planar turntables on Record Store day. The Rega RSD turntable benefits from a high quality built in phono stage, custom printed mat, matching lid badge, Record Store Day screen printed plinth, premium smoked cover, Rega Carbon cartridge, and is a plug and play design. And in case any of you were to doubt the commitment of Rega in the support of playing records, we bring you the redesigned Rega Planar 78 turntable. Yes, that’s right it plays at 78 rpm (and only 78 rpm!). Another Rega photo as we do not keep this in stock. It is available to order £349 excluding cartridge. Join with Julian, Paul and John to explore what Linn and Rega turntables can bring to you and your record collection. Discover more of the music from your records. Yes that's right a Goat. We have been experimenting with the phono stage in the new Ruark R5 just to see if it really can do everything really rather well, or if we could find a chink in the armour. R5 Planar 2 and Goat. Can you spot it? As in Preston’s wonderful blog on the arrival of the R5 and its many features, it is a hugely versatile and a great sounding system as one would expect from a Ruark product. However, we know that built in phono stages can be can be of variable quality, so we thought we would put the Ruark through its paces. The circular remote takes a short time to learn how to navigate but very pleasant to use when you have. We felt the Rega planar 2 (with Carbon cartridge) was a suitable match as you could hear the difference between the Planar 1 and the 2 quite clearly. We did try the Planar 3 but didn’t feel you where getting the best out of it. After a short listen we had a quick play with the sound settings to a) see how easy it is and b) to find out how much more we could pull out of the system. It was super easy and you can make the changes during playback making things fast and efficient. We switched off 3D sound, switched loudness on and kept bass and trebile level. This seemed to give the overall sound presentation more openness and clarity, allowing more control in the room. Of course this can differ from room to room, and the surface upon which the R5 is placed will play a role in how the system sounds. Then we cranked the volume and enjoyed some Goat! So, why do I keep saying Goat. Well Goat are a Swedish Alternative/Experimental group, who formed in 2012. Their main genres are various types of rock such as experimental, psychedelic and hard sort of world music (that being the name of their debut album). I often get asked by customers if I have come across anything new and a bit different, well Goat fits that bill. 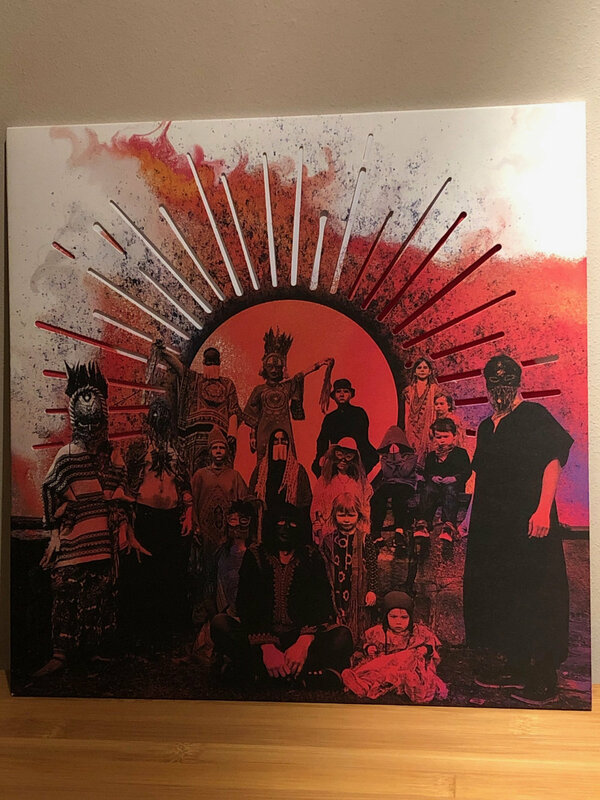 The album is very well produced, open and a good system test. Certainly worth a try. After listening to two of the four discs at various volumes we decided that the built in phono stage is certainly not a chink in the armour but another strength. In conclusion, much as expected the Ruark R5 is an all-round fabulous portable music system bringing stylish, compact quality and great sound into the home. We look forward to seeing you in the Portsmouth branch so can can hear it for yourself. If a home demonstration is required that can also be arranged. The all new Ruark Audio R5 has arrived. As we have come to know and love from Ruark is that they are well designed and visually pleasing, and jam packed with features for a single box music system. The R5 is fitted with a multi-format CD player that will play self made discs in WAV, AAC and MP3 formats and has an OLED display for clear information display. You can connect a mobile device to the R5 using the very latest in Bluetooth technology, AptX HD Bluetooth. Or, if you prefer you can stream music from Spotify, Spotify connect, Deezer, Amazon music and Tidal streaming services which are all built in to this competent and visually appealing unit. You can choose from a phenomenal range of music stations on FM, DAB and DAB+ or from anywhere in the world using internet radio where you are sure to find something for your listening pleasure. The R5 will connect directly to your network either via an ethernet port situated on the back of the unit or via WiFi. The R5 even lets you play your stored music from a network hard drive using the UPNP feature. The Ruark R5 is equipped with a built in phono pre-amplifier enabling you to connect a turntable directly with no additional boxes required. Ruark have also expanded the physical inputs on the R5 to include an optical input to connect your TV or another digital device as well as an analogue RCA input and a USB port for playback from USB devices in a variety of file formats. Situated on the front of the R5 is a convenient headphone socket for those late night listening sessions enabling an up close and personal performance from your favourite artists day or night. This latest addition to the Ruark Audio line up the R5 has a full remote control that works on radio frequencies so doesn't need to be pointed at the unit and if you misplace the remote control temporarily, there are controls on the top. Ruark Audio have a control application 'Ruark Link' which works with both Apple and Android devices giving you all the control you will ever need over your music. The R5 is multi-room ready so will connect with MRX, R2 Mk3 and R7 Mk3 for seamless multi-room playback. For this year’s Record Store Day we’re going to have a fun day in store, when we’ll set up a couple of fab vinyl based systems and play a selection of classic albums all day. The fantastic Audio T offer of one of our excellent record bags free with any turntable purchased will be in full effect. We will of course have the limited edition Rega Record Store Day turntable available on a first come first served basis. Of course we’ll be happy to offer advice on upgrading or servicing your turntable as well as having a selection of vinyl based accessories from stylus brushes to phono stages to help you get the most out of your deck. Or try out one of our record cleaners and see how that can improve the sound quality of your music. Oh and we have actual records for sale too!!!! We have always been fans of Audiolab electronics. With that in mind we are very happy to announce we have the Audiolab 6000A Integrated amp and Audiolab 6000CDT CD Transport on permanent demonstration for your aural pleasure. Starting with the Audiolab 6000CDT CD transport first, you will notice that this now sports a slot loading mechanism instead of the standard tray loading mech. This ensures almost silent operation, together with excellent disc reading accuracy. The large front display can be switched off to further enhance not only the signal purity but also the sleek styling. Moving on to the Audiolab 6000A integrated amplifier, this pays homage to the classic Audiolab styling but brought bang up to date. It now has an inbuilt phono stage (Moving Magnet only), Bluetooth receiver, onboard DAC (4 Digital inputs) and a headphone input. Moving to rear of these beauties, the CD Transport has both optical and co-axial outputs. The amp has the aforementioned 4 digital inputs and an additional 3 analogue inputs along the MM Phono stage. Finally, we connected these up to a variety of loudspeakers and have had excellent results with brands such as Acoustic Energy and B&W among others. We found an ideal partner for vinyl replay in the shape of the Rega Planar 3 / Elys combination. We are very proud to take our love of Bowers and Wilkins speakers to the next level, and welcome the 800 Diamond series to the Bristol shop. We have all models from the 800 range on demonstration and boy do they sound good! The range starts with the 805; a classic standmount and an excellent entry into the 800 series. We move swiftly on to the floor standers, starting with the 804 then onwards and upwards with the 803, 802 and the unbelievably good 800. The Bowers and Wilkins 800 D3 loudspeaker. Perfect fit for our dem room. We all went to the factory in Worthing, a couple of weekends ago, to get trained up on the range and be introduced to the amazing manufacturing techniques developed by Bowers to make these fabulous speakers. All lined up and ready to bring a smile to many peoples faces. The factory is now dedicated to the production of the 800 Diamond series and watching the staff do their work was an experience in itself. They are all obviously passionate about what they do and the standards are so high that you can pretty much guarantee, all the products leave the factory perfect. It is even in the employees contracts that they are not allowed to drink alcohol the night before they have work to ensure a steady hand. The matrix. This is what allows you to here the music and not the cabinet. We all came back to Bristol having thoroughly enjoyed the trip. A bus mans holiday it certainly wasn’t and we couldn’t wait to get back to the shop and listen to our 800’s. They are here if you want to indulge. We will be doing in depth reviews as well as dedicated listening events in the very near future.